In 1986, a Stephen King novella in which a writer reminisces about the formative 48 hours he spent with his best friends searching for a dead body became the classic film Stand by Me. Here are some facts about the Rob Reiner-directed movie that will ensure you aren’t stupid for the rest of your life. 1. IT CAME FROM THE SAME STORY COLLECTION AS THE SHAWSHANK REDEMPTION. Stand by Me came from the story “The Body,” which was part of Stephen King’s 1982 collection Different Seasons. The collection also included “Rita Hayworth and the Shawshank Redemption,” which was adapted into The Shawshank Redemption in 1994. ("Apt Pupil," which Bryan Singer adapted for the big screen in 1998, was in there, too.) For the movie, “The Body”’s setting was changed from Maine to Oregon, and the year from 1960 to 1959. 2. ADRIAN LYNE WAS ORIGINALLY SUPPOSED TO DIRECT. But the future director of Fatal Attraction promised himself a vacation, which would have significantly delayed filming. Rob Reiner, who had recently made the transition from actor to director with This is Spinal Tap and The Sure Thing, stepped in. 3. COCA-COLA ALMOST SHUT DOWN THE MOVIE ENTIRELY. The soda company bought Embassy Pictures, the film's original production company, and announced they weren’t going to fund Stand by Me just two days before they were set to start shooting. Television legend Norman Lear—who had worked with Reiner for years on All in the Family—was one of the three owners of Embassy prior to its sale. He believed in the project enough that he agreed to personally foot the film's $8 million budget. 4. RICHARD DREYFUSS WAS AT LEAST THE THIRD CHOICE TO PLAY ADULT GORDIE. David Dukes was cast, and allegedly was filmed playing the part, but ultimately it was decided that he did not have the “right voice” for the part. After Michael McKean gave it a shot, Dreyfuss nailed it. Reiner and Dreyfuss had known each other since they were 15 years old. 5. REINER HAD THE KIDS PLAY THEATER GAMES BEFORE FILMING BEGAN. Wil Wheaton (then 12), River Phoenix (14), Corey Feldman (13), and Jerry O’Connell (11) met Reiner and some of the crew in an Oregon hotel suite in June of 1985 to perform games based on Viola Spolin’s Improvisation for the Theater to develop trust in one another. The actors did things like mirror each other and talk each other through traversing the hotel lobby while blindfolded. 6. PHOENIX LOST HIS VIRGINITY DURING FILMING. Reiner remembered that Phoenix came into work one day “with this big smile on his face” after spending the night with a family friend. Feldman drank alcohol, kissed a girl off-screen, and smoked pot for the first time during that fateful summer of 1985. 7. WHEATON FIXED THE GAMES IN THE HOTEL SO THAT THEY COULD PLAY FOR FREE. Phoenix told Wheaton that if he managed to pull it off, he would take the blame for him. 8. REINER HAD TO YELL AT O’CONNELL AND WHEATON SO THEY WOULD LOOK SCARED. The young actors were never in danger of actually getting hit by the train, thanks to the use of a 600mm image-compressing camera lens. Because of this, Vern and Gordie weren’t looking fearful enough in the scene, meaning that they had to shoot take after take with an exhausted crew pushing a heavy camera down the train tracks. Their director lost his temper, screaming that they were “f*cking this thing up” and threatened their lives. Reiner got his shot. 9. PHOENIX HAD TROUBLE TURNING OFF HIS EMOTIONS. Reiner again was forced to provoke unwanted emotions from his young stars, asking Phoenix to think of a time when an adult let him down before shooting the scene where Chris had to talk about how worthless he felt. Once they got it down, Phoenix couldn’t stop crying. Reiner hugged him to help stop the tears. 10. THE ACTORS DIDN’T SEE THE DEAD BODY UNTIL THE CHARACTERS DID. The idea was to get the most authentic reaction possible by not revealing Ray Brower’s body to the kids until the last possible moment. 11. JERRY O’CONNELL WAS FRIGHTENED OF KIEFER SUTHERLAND. Sutherland played bully Ace Merrill, and liked to stay in character off-camera. The three more seasoned actors playing the good guys didn’t seem to care; O’Connell was legitimately scared. Presumably a part of staying in character for Sutherland was rolling a car off a sand bank with John Cusack, who played Wheaton's late brother. 12. O’CONNELL GOT SO HIGH THAT PRODUCTION HAD TO BE SHUT DOWN FOR AT LEAST A DAY. In two late night talk show appearances, Sutherland claimed that O’Connell managed to tie his babysitter to a banister and escape to a Renaissance Fair. Unfortunately, according to Sutherland, young Jerry’s cookies had pot in them. He was allegedly found two hours later crying in a parking lot. 13. REINER CAME UP WITH THE TITLE. 14. STEPHEN KING WAS IMPRESSED. After Reiner screened the finished product for the author, King excused himself for 15 minutes. When he returned, he said it was the first time one of his stories was successfully put on film. King even applauded Reiner for changing it so that Gordie picks up the gun instead of Chris, wishing he had thought of that in the first place. 15. PHOENIX WAS A "TOTAL WRECK" BY THE END OF FILMING. After his critically acclaimed role, the young actor said he identified so much with his character, Chris Chambers, that if he didn’t have his family to go home to, he would have needed a psychiatrist. 16. THE TOWN OF CASTLE ROCK WAS ACTUALLY BROWNSVILLE, OREGON. 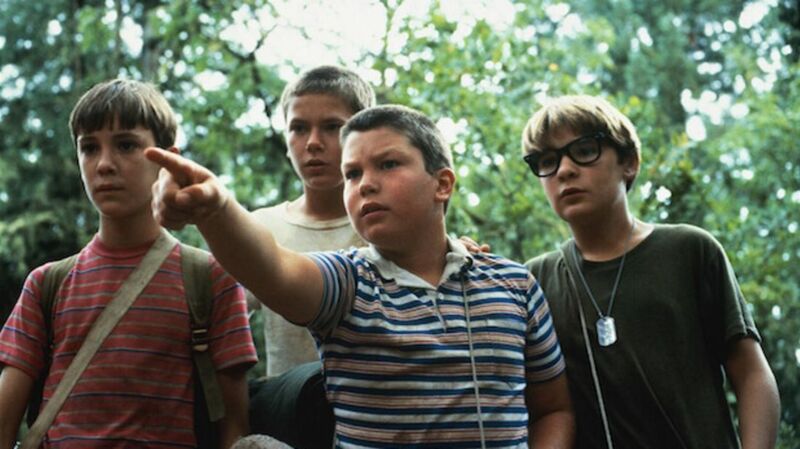 Stand by Me was also shot in and around the Oregon towns and cities of Eugene, Veneta, Franklin, and Cottage Grove. (The only part of the movie shot in California was the scene where the boys outrun the train.) At the Brownsville visitors center today, there is a map that displays all of the movie's locations in five different languages. Rob Reiner named his production company Castle Rock Entertainment after the fictional town.